The first creamy soup I ever made, was a cauliflower soup. The reason I remember it is because this soup was included in our new healthy diet I wrote about some time ago. Many things were new and exciting but this particular one stayed with us until current days. It was just a matter of making myself writing down the recipe, as it’s so easy to cook by adding things into a pot and not measuring the ingredients. It is an easy recipe to make and rather seductive in its taste so my guess is that it might become one of your favourite soups. I don’t really like to use much dairy to achieve a creamy structure of a soup. I had to look for a different option. Imagine my joy when I realised that it is possible to make a creamy soup without adding full cream milk. I was over the moon with happiness! If you are one of those you will love it too! 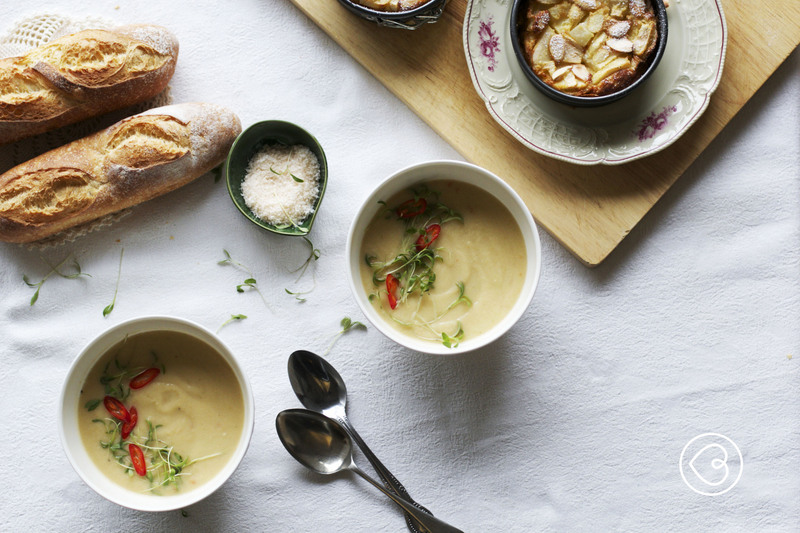 Just a tablespoon of butter makes a whole difference to this soup – plus a lot of whizzing. It needs to be very smooth! Another important note – the amount of chillies used for this soup is almost scary, but it’s necessary, so don’t avoid it. It goes nicely with the creamy cauliflower and most importantly it’ll make you laugh a lot while eating and afterwards! At least that’s our experience, and it never fails. On both a very cold, or a very hot day, I promise, you would benefit from eating this soup. To find out more about cauliflower benefits, visit well-beingsecrets.com. To prep – wash and chop cauliflower. Peal and dice onion and garlic. Wash and dice celery. In a large size pot add olive oil and once it’s heated add onion, garlic and diced chilli peppers. Cook and stir for two minutes, then add celery. Cook all together for another 2 minutes and add cauliflower. Pour in water and add salt and pepper. Bring to the boil, then reduce the heat and simmer for 30 minutes or until cauliflower is cooked. At the very end, add butter and stir until it’s all melted. Leave it to cool down a little before transferring to the blender. Blend the soup until it is very smooth and creamy. I added micro coriander and some chilies before serving but that’s optional. 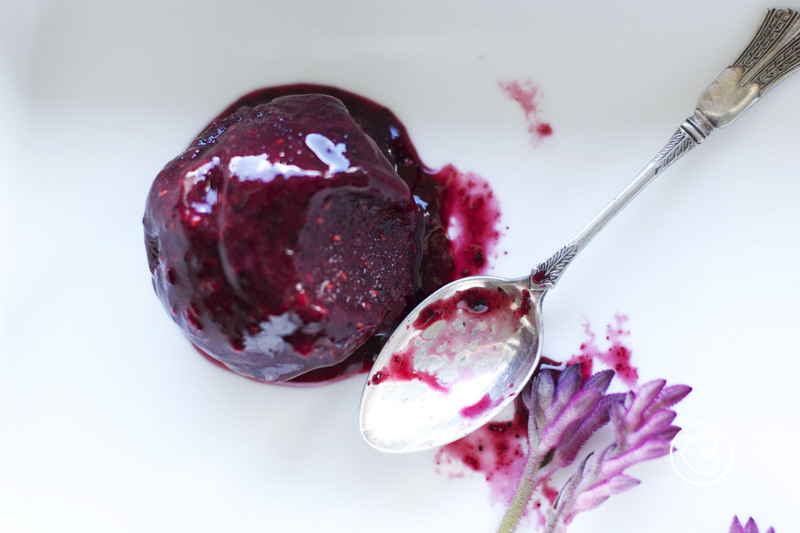 The famous French treat was just recently seriously considered as one of the leaders in our family’s world of desserts. Its name is – Clafoutis! I remember the first one I ever made was with cherries. It’s kind of traditional one and as far as little google research goes, we are to use the whole cherries, with pits, in order to achieve an extra flavour. While I am waiting for the cherry season to share that recipe, I’ve decided to go with pear and almond Clafoutis. It became so popular that I might never get to make a post about the cherry one, we might stick just to pear and almond Clafoutis. Then again, who am I kidding, a recipe not to be tested and posted – impossible! 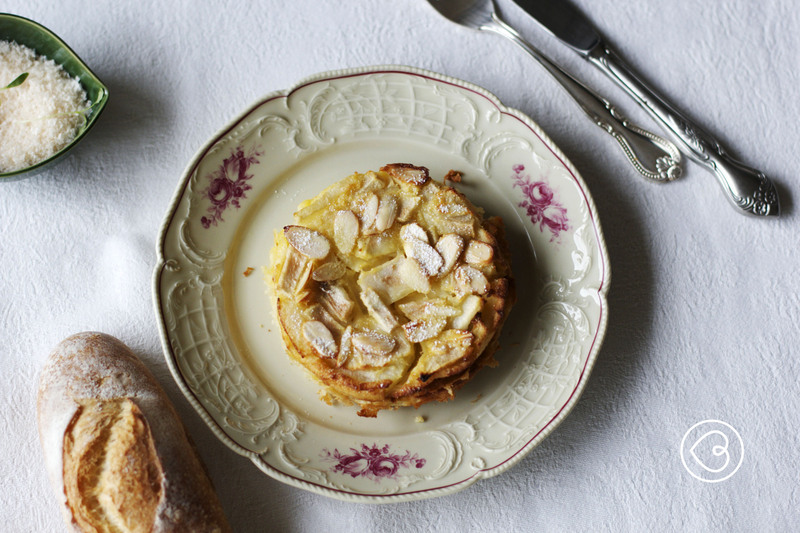 Stay tuned and enjoy pear and almond Clafoutis while pears are in season. Pre heat the oven to 180C. Grease a baking tin with butter. Mix the eggs with sugar. Add the flour and mix well to loose any crumbles. Gradually pour in the milk and at the end add almond essence. Pour 1/2 of the batter into the baking tin previously greased with butter. Arrange pears and pour the rest of the batter on top. Sprinkle with the almond flakes and bake at 180C for 45-50 minutes or until golden. Dust with powdered sugar before serving. Can be served hot or cold. Enjoy! This dish brings back childhood memories as my mother makes the best stuffed veggies (her favourite are stuffed capsicums) in the whole wide world. There is a tiny secret that makes most of her dishes special. She likes to add bacon, pancetta or prosciutto to all her stuffed veggies, and with a good quality of any of those we always end up with a marvellous dinner. Nothing lifts a dish to a masterpiece as good, cured and preferably smoked piece of bacon! Now that I’ve presented cured meat as a main achiever in this dish I wonder if there is a point in listing other ingredients at all. But there is! This particular dish wouldn’t be as delightful as it is without good and ripe tomatoes. The smell of fresh tomatoes will reflect in your dish so use the best you can find – always! The good quality mozzarella is another of my favourite parts of this dish. Creamy straight from the oven and almost crunchy just after a few minutes outside of the oven makes it an extra treat. Sprinkle of chopped spring onions brings the freshness to the whole idea of a vegetable dish and we all love it! Hope you will too. Slice the tops of tomatoes and set aside. Scoop out tomato flesh with a small spoon and keep it aside. Chop prosciutto to approximately 1×1 cm pieces. Sauté the onion, carrot and celery with bay leaf for a few minutes. Add the meat and stir until it is almost cooked. Pour in tomato flesh and cook on a low temperature until liquid is reduced. Add the balsamic vinegar, salt and pepper and leave it to cool down for a few minutes. Arrange tomatoes, cut side up, in an olive oil greased baking dish. Stuff meat mixture into tomatoes. Place tops on tomatoes and top up with small pieces of mozzarella. Grate parmesan on top and bake at 180C for 45 minutes. Sprinkle with spring onions before serving. In less than a month we are to start our journey across the world. That always means visiting our family. We are all looking forward to it and we all have our reasons. The youngest one is mostly looking forward to the love and attention (gifts included) that he receives from everyone in immense quantities. The rest of the family, which are the two parents, are glad to provide the above mentioned happiness to the young one and indulge the grandparents with the presence of their grandchild. But don’t think that this is a sacrifice to us, as we, the parents, have our own little moments that make this time special. They mainly include wondering through the city, remembering and reliving our past, or making new adventures and stories with our son. There is a whole list of things to do but I am mostly looking forward to the slow pace of the days that any holiday should provide: short and long walks, time together, good food and small treats. Which brings me to the subject of this post. May not be a small one but it’s certainly a treat! 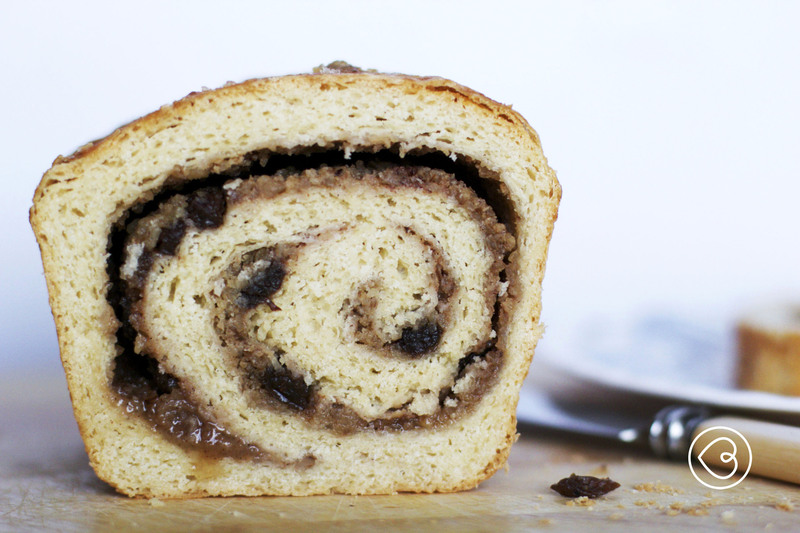 Walnut and raisin swirl bread is one of the famous desserts from back home. That means that it is known among many Balkan countries, as well as Germany, Austria and a few more. It is called Strudla, Strudel, Zavitek… or as we here know it: Swirl Bread (which I like for its descriptive name). One can buy it in any bakery or patisserie across the country but the homemade ones are always the best! Like many other well known recipes, and the same rule applies for this one, every household has a family recipe and claims that it’s the best one. So far I’ve tested a few, all good no doubt but one enjoyed the most always reminds me that it’s my favourite. It’s the one my mother-in-law makes! What makes it the best are not just the ingredients. It’s made with care and love for her family and those are the magic ingredients that you can find only in homemade treats. She gave me the recipe and I follow it with all my heart. I can only hope that my family enjoys is as much as I enjoy baking it for them. Add the flour, yeast, sugar and the salt in a stand mixer bowl. Use a dough hook to mix all ingredients. Combine the milk and water in a measuring cup. Make sure you warm them up to approximately 50-55C (too hot to dip your finger in it), which is slightly warmer than you need. Add the egg and whisk all together. The egg will cool down milk and water mixture. Pour liquid mixture into the stand mixer bowl with flour in it and kneed for 5-6 minutes or until you get a nice and smooth dough. Cover with clear wrap or kitchen towel and let it rise for an hour or until is doubled in size. This dough is very easy to work with, which is rather good as the work is not done yet. Place the dough on the lightly floured working bench and roll it into a 20×30 cm rectangular shape. Spread approximately 1/3 of butter on top and fold a short half of the dough only half way through and then fold the other half on top of it. You will get a rectangular shape approximately 20×15 cm. Take the longer ends and fold them the same way making again a rectangular shape 10×15 cm, which will make one very chubby peace of dough. Roll the dough again into a 20×30 cm rectangular shape and repeat the whole process 2 more times. This way you are incorporating butter into your dough, making layers which will help you bake a wonderful swirl bread. So, it looks like you have to use a bit of an old fashion baker’s technique here, but it pays off so much that you wouldn’t want to do it any other way. Mix walnut meal, sugar, cinnamon and milk in a small bowl. When you are done with making a perfect strudel base and you have rolled your dough back to a 20×30 cm rectangular shape, spread walnut and cinnamon mixture on top and sprinkle with sultanas. Roll the dough, starting from the shorter edge. Transfer the dough into a greased baking tin and let it rise for another hour. Brush with milk and bake at 180C for 45 minutes or until it’s golden brown. We are a family of three and on a daily base the emotions easily become intense, good or bad, as there is no one else to turn to – but us. The rest of the family lives around the world, so other than the yearly visits to see some of them and lots of Skype time, we rely on our little family of three. Or at least that is how I saw it. Our son needed some time to understand that mum and dad were there to share their time, love and wisdom with him – evenly. For him it was simply natural to be around mum, and sometimes his father had to work hard to get his attention. Although it required much patience to manage the feelings, I new that it was just a matter of time when my leaving the house wouldn’t bring tears and a simple “bye mum” would replace them. That has been the case for some time now and as much as I enjoy the emotional growth I do miss the obligatory hugs and kisses I used to receive. On the other hand, that gives me a better understanding of being “the other parent”. Now I admire the father’s patience and wisdom even more. He was always there when needed, and patiently waited for the child to realise that he could share some moments with his father only and by doing so make them even more precious. This cake is only a symbol of our love but it’s a sweet one and we love it, so why not share it! The favourite cake of all times for this family will be this one but this new version might replace the favourite one at least occasionally, as we have learned that new exciting ventures are just around the corner, we just have to let them reach us. 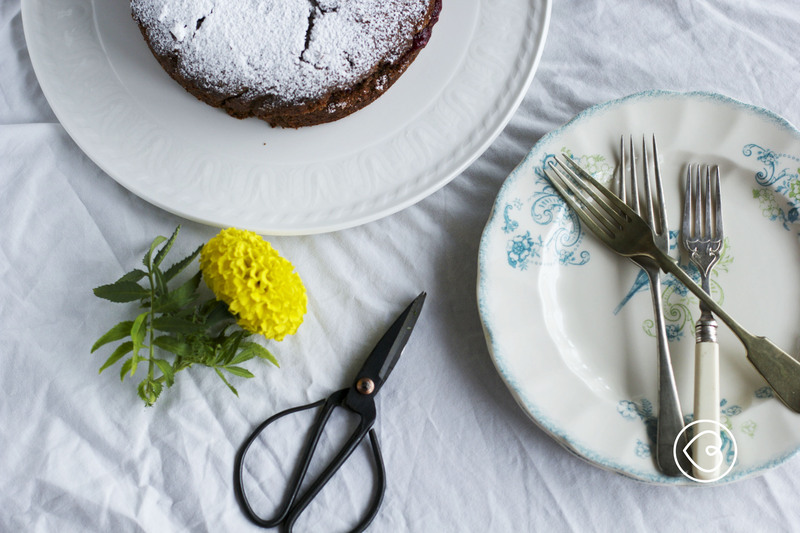 Elisabeth David’s flourless chocolate cake is a perfect example. This particular one is for all the fathers out there who love chocolate cakes! Preheat oven to 150C. Line a 23cm baking tin (with removable base) with baking paper. Melt chocolate in a double broiler, add the coffee and rum, stir and add butter. Stir the mixture gently until butter is melted. Add sugar and egg yolks (one at the time) and stir again. Whisk the egg whites until soft peaks form and fold into the chocolate mixture. Pour into the baking tin and bake for 45-50 minutes. Cake should have crust on the top and should be very soft in the middle. That means it’s perfect! Best eaten as is or you can dust it with icing sugar. Lately, I found myself thinking how we humans have a tendency to overdo – whatever we are doing really. A cake has to have two icings, or more than two colours for decoration. A dress is too plain without an additional scarf or a necklace. Watching a movie and not having popcorn is unthinkable. Doing at least one more thing while we are on the phone, well we can’t imagine the other way around. The list can go on and on… and that is life these days. Yes, I agree, some things give us pleasure, they don’t necessary go just under a must category. Like the popcorn we’re eating while watching a movie with our child, for example. That wasn’t my point though and the question to myself and to all of us is – can we just be? Can we create only simple things and maybe gain extra free time? Imagine having that free time – every day. What would you do with it? How about – nothing and just be? Wouldn’t that be nice? How many times have I done that? Not many if I want to be honest as I have the tendency to bake every chance I get. You might say that these gluten-free biscuits contributed to my tendency to overdo things, but you see, I had a good reason for baking these! A friend of ours is baby siting our son and the parents – us, are leaving the house for a movie session and a glass of wine. I had to add something sweet to their pizza and a movie at home. After all it’s one of the ways of saying thank you to such a good friend. You have to agree it’s a mighty good reason for baking biscuits. As our friend is a gluten intolerant I planed a gluten-free treat. Although no one in our family is gluten intolerant, we enjoy all those flours for their particular taste. Sorghum flour is one of them. Lately I like to use it for biscuits more than cakes (the youngest in our family is not so crazy about cakes made with sorghum flour) and these are one of them. They go very well with Miyazaki movies and with a glass of wine afterwards. Preheat the oven to 180C. Line a baking tray with baking paper. Mesure and mix the flours, baking powder, sugar and salt in one bowl. Whisk the egg yolk with the water in the food processor and add slowly olive oil until you make mayonnaise. The mayonnaise won’t be as thick as normally is so you shouldn’t worry if it looks a bit runny. Pour the mayonnaise into the flour and mix with your hands (which is what I did) or use a stand mixer with a classic beater attachment. Add the lemon zest and lemon juice and knead until you get a nice and smooth dough. Don’t overdo it; you don’t want to warm up the dough too much. Cover with clear wrap and leave in the fridge for 30 minutes to rest. Once ready, roll the dough into 5 millimetres thick sheet. Using a ruler and a pastry cutter cut the strips 4 centimetres wide. Cut again, horizontally, to make the rectangular-shape biscuits (I made mine 6 centimetres long). Use all off cuts to make the biscuits by repeating the process. Place the biscuits onto the baking tray, leaving enough room in-between. 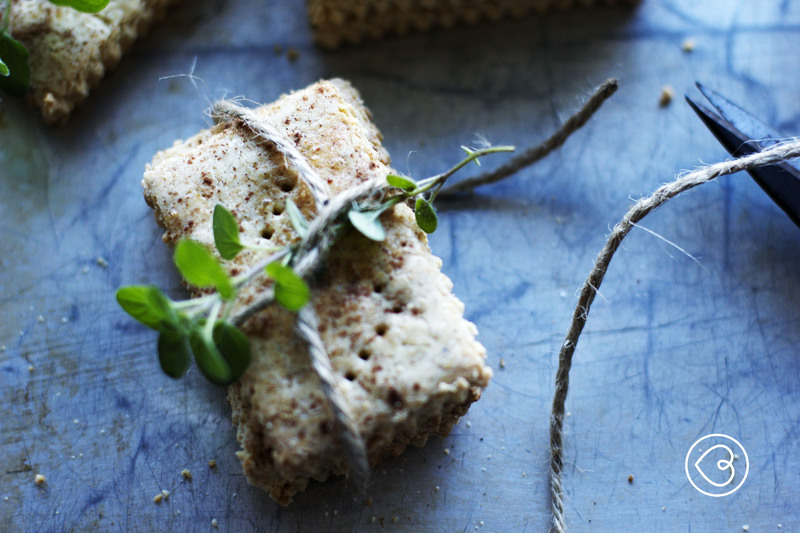 Brush with the lightly whisked egg white and dust with the ginger powder and cinnamon powder. Bake for 20-25 mites or until the biscuits change colour. Once done leave on the baking tray for 5 minutes before transferring to the cooling rack. May be kept in the airtight container for 2 weeks. We produce, serve and eat. We share as often as possible but most of the time it’s just us, the family of three conquering a dinner table. Because of that, updating this blog just with sweets as much as we love them, was starting to be too sweet for all of us. So occasionally I am going for the other option like this one for example. A treat for sure and a mighty one! Cured ocean trout! I believe that most of the time our productivity depends on either how keen we are to do something or how trained or informed on the subject we are. That applies to producing food as well. If one is not well informed or lacks in technique, but is keen to do it, they can do it, for sure. I thought that this technique would be a daunting one until I found the courage to do it. Now I am thinking how I should never let my fear stand between me and any task in the future. My mission is accomplished, let me know – how did you go? What you need for this job is a bit of patience to start with, a good piece of ocean trout, some spices and herbs. Also the a good baguette and creme fraiche for serving and if you add a glass of wine to it you are well off for a great brunch or lunch. Over time I’ve tried a different versions and the one I am sharing today is my most favourite one. Clean and wash the piece of ocean trout. Dry with a cloth to remove any extra water. Grind the spices in a mortal and pestle. Mix the salt and sugar, add the spices and mix all until combined. Place clear wrap on the working bench (it needs to be long enough to wrap the whole piece of fish) and cover the middle of the glad wrap with half of the sugar and salt mixture. Place the fish on it and sprinkle lemon zest and coriander on the top. Pour the other half of the sugar and salt mixture on the top and wrap tightly with clear wrap. You need to do it three times, so the fish is nicely tucked in the sugar and salt mixture. The first layer will be the hardest one to wrap, but you’ll have to manage somehow if you want to finish the job. On the second layer it’s easier to tighten the clear wrap around the ocean trout, which is necessary if you want the fish to be cured. Thus it’s very important that trout is also equally covered with sugar and salt mixture. Leave in the fridge for 48 hours but you have to turn it over after 24 hours so it’s cured evenly. When it’s done take it from the fridge and wash thoroughly. Dry with the clean kitchen towel and place in an airtight container, whole or sliced. You can keep it in the fridge for several days. Add lemon zest to creme fraiche and stir until all lemon zest is nicely incorporated into the creme fraiche. To assemble: spread creme fraiche on a slice of the baguette. 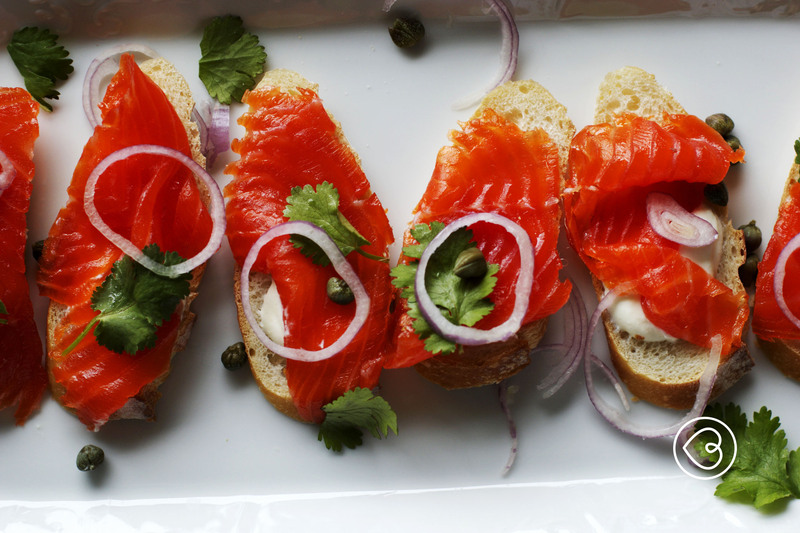 Place one thin piece of ocean trout on the top and sprinkle capers, shallots and coriander. I say nothing can beat that colour to start with but the taste – well you have to try it yourself! Do you know when to use the terms as “tart”, “quiche” or “pie”. Do you find it confusing? They all represent the same dish just with tiny differences. With “tart” you have to be precise if it is sweet or savoury, because it could be either. “Quiche” is always savoury so you are safe there. “Pie” could also be equally confusing as “tart” so make sure to name it properly. When you add a flan or galette to the list, phew, it is so confusing that you really want to go to the basic and use the name as you need it. A savoury tart with kale and a few more vegetables and of course a goat’s cheese would be a precise name for this one. I emphasise the goat’s cheese as for me a savoury tart alway goes with it. I am afraid my love for this cheese makes me less creative but I promise that any new ideas will be shared here as soon as they come along. When I make a tart or quiche base I use a simple ratio method of 2 portions of flour, 1 portion of butter and liquid (quite often just water) to bind it. To the savoury tarts I add various herbs, fresh or dry. To the sweet versions besides just a bit of sugar, I add preferable spices. The rest is a creative process of adding different fillings and that’s up to you and your preferences. I used kale, red onion, Dutch carrots and chèvre for this one. Although all the ingredients in this tart are quite powerful, just recently I was introduced to the site that tells you more about superfood like kale and I would like to share it with you. Preheat the oven to 180C. Grease a tart tin (20 cm round shape) a with removable base. If using one without the removable base then line the tart tin with baking paper so it’s easier to remove the tart once baked. In a medium size bowl mix the flours, salt and add butter chopped into very small cubes. Crumble the butter with fingers until is the size of peas. Add egg, water and and kneed the dough just until all is mixed and smooth. Leave in an airtight container in the fridge for an hour to rest. In the meantime make the filling. Peal and slice the onion. Wash kale and remove the stems. Chop coarsely. Place large pot on the stove add olive oil and sauté onions for three minutes. Add kale and salt, stir and cover with lid. Leave on a low heat for another minute or until kale changes colour into a bright green. Take off the the stove and remove the lid to slow down the cooking process. Wash carrots using a sponge, carefully removing all the soil or dust. Remove the green parts. In a medium size bowl mix eggs, add salt, ricotta, parmesan and yoghurt and stir until all combined. Take the dough out of the fridge and roll between two sheets of baking paper into a round shape, 5 cm in diameter bigger than the size of the tart tin. Transfer the tart base into the tart tin. Arrange, trim and crimp the edges. Prick the bottom of the tart base with a fork and leave it in the freezer for another half an hour. Once tart base is well chilled take it out of the freezer, line with baking paper, fill with beans and bake for solid 20 minutes. Take the tart base out of the oven and fill with onion and kale mixture. Pour the eggs and cheeses mixture on the top. Arrange Dutch carrots on the top, pressing them gently into the filling. Grate parmesan on top and bake for 40 minutes or until carrots are baked. Sprinkle with chèvre just before serving. My first visit to Australia was a very short one. It happened almost unintentionally as Sydney airport was the last stop on our way to New Zealand. We landed at 5am. The first thing I noticed was the heavy rain outside. Somehow I didn’t expect that! The picture of Australia I imagined had nothing to do with the reality I could see through the windows. Also, I guess after being high in the air for so many hours we expected the same light to meet us on the ground. Certainly not heavy rain! My thoughts switched very quickly to my immediate needs as after a very long and emotionally difficult flight all we needed was a cup of coffee and a quiet place to enjoy it. It was quiet at the airport, that’s for sure! Hard to see a living soul if I want to be precise, not to mention a coffee or any kind of treat. All the coffee shops were closed and all the treats one could see were behind the windows of display fridges. That was a sad picture. All I could think was: “Is this how things are on this side of the world?” It makes me feel sad just thinking about it, even now. Don’t get me wrong, I didn’t expect much from visiting an airport but visiting Australia for the first time I thought even airports would be more exciting. At least that’s how I saw things back then. (In our defence, we were very young). Sometimes we see the world through different eyes. Sometimes things might look sad, and other times happy but that still might not be the real picture. So I’ll tell you about my first real visit to Sydney. Just a few years later I had a chance to visit Sydney in a much happier mood to start with. The fact that our trip was to happen just after celebrating the new millennium in New Zealand attributed to the whole happy arrangement. Still happy from a glass or two of wine and most importantly for surviving the biggest threat mankind experienced, the millennium bug and all other unnamed bugs, we headed for another new experience. An Australia Day to celebrate in Sydney and I dare to say – the most glamorous city in Australia. How exciting! Needless to say those days were as nothing we experienced before especially when it comes to watching the fireworks, eating the lamingtons and coping with the rain! Unexpectedly and far from our expectations, on that magnificent day it rained almost throughout the whole day and when it didn’t it was so humid that we wished for the rain to start again. We needed an excuse for hiding within the plastic raincoats we had to invest in on the spot (and I am never ever to show that picture of me in a raincoat of an undefined blue colour standing on an open field covered with wheat hay). But I have to tell you that the fireworks around Darling Harbour were magnificent! 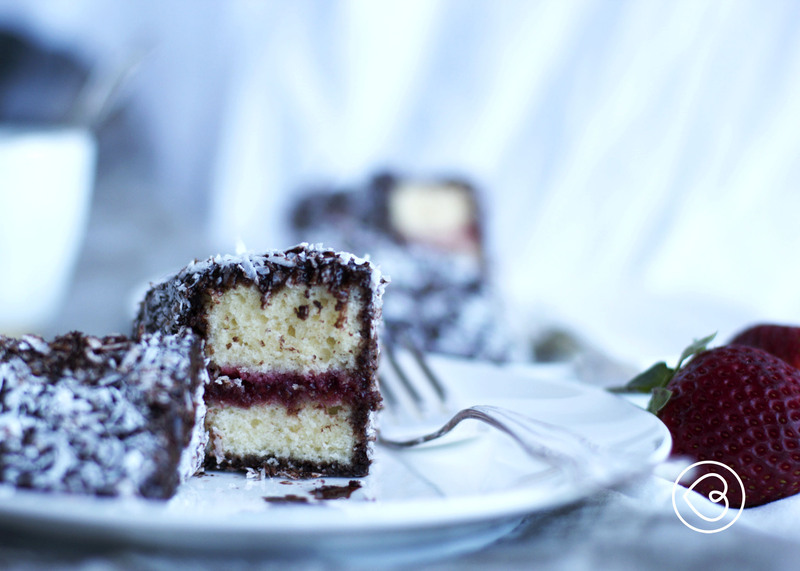 And the lamingtons, well I still do remember those. These are their reincarnation. Beautiful, moist and festive. Enjoy! I used my favourite sponge cake, enriched with olive oil. Olive oil will give the cake an extra flavour as well as a different texture. This way the lamington base is thicker or sturdier if you like to see it that way. Pre heat the oven to 180C. Grease a baking tin on the sides (I used 22cm round cake tin) or line it with baking paper. Separate the eggs and whisk egg whites. Whisk for about 3-4 minutes or until they reach soft peak. In a separate bowl sift flour, add baking powder and stir. Whisk egg yolks with hand whisker add milk and good quality olive oil as this will affect the taste of the cake. Add flour to it and mix until you get smooth and thick batter. Add egg whites while gently string with spatula. Try not to brake the fluffiness. Pour the batter into the baking tin and bake for 25 minutes. Check the cake with a cake tester before taking out of the oven. Leave on the cooling rack to cool completely. Slice the cake horizontally in half and spread one half with the jam. Top with the other half and leave it to set (I left in in the fridge overnight). To make the cocoa icing you need to sift the cocoa and the icing sugar into the bowl. Add hot water just to combine, melt and mix all ingredients. My suggestion is not to make it too runny. Spread desiccated coconut onto a baking sheet. Cut the cake into 12 slices. Dip each into the cocoa icing and leave for minute or two on the cooling rack for the extra cocoa liquid to drain. It is less messy that way. Roll each slice of the cake in the desiccated coconut and leave on the cooling rack to dry before placing into cake box. One of the best parts of being a parent to me is the opportunity to exercise the brain cells and watch the learning curve grow every single day. I am not referring to the child’s learning curve here but ours, the parents’. I learn from my child every day! Most of the time something rather simple, and other times something amazing, but I equally enjoy the benefit of both. My favourite example of a simple and an ordinary hint would be our hot cross bun discovery a few weeks ago. I didn’t take these little treats seriously until my son pointed that way. On one of our cruises through the city and bookstores/ice-cream shops days, which are nicely aligned, with long working hours, so a rather late afternoon stroll is possible, we decided to add a cherry on top by visiting a bakery as well. The choice fell on the chocolate chip hot cross bun, straight after the chocolate ice-cream, but on some days we have more fun than usual. The mother (me), decided to skip this treat but the son insisted I have a bite at least, as he (lucky for me) likes to share his experiences with me. One bite was enough to realise what I was missing all those years and needless to say – hot cross buns are on our menu from now on. When I started thinking about the recipe the first thing that crossed my mind was this beautiful and unforgettable post about hot cross buns (just as all the others on the same blog) followed by a recipe, and my decision was made even before I had a chance to think any further. I started with regular hot cross buns (as “one learns from scratch” is my motto) but the family was quite indifferent to them so I changed the recipe over to chocolate chip hot cross buns. I have to adjust the recipe to our needs and include the chocolate almost every time, and this time was no exception. Not that I am complaining, but honestly, the mother (me), needs to start a detox as soon as possible. Melt the butter in a pot with the milk on a very low heat. Leave aside to cool or to speed the process place it in the fridge until it is cooled to room temperature. If the milk is too hot it’ll kill the yeast, if it’s too cold it’ll slow down the rising of the dough so room temperature is the best option. Mix the flour, yeast, sugar, salt, cinnamon and ginger powder using a stand mixer. Whisk the egg lightly, add zest of one lemon and pour into the cooled milk and butter mixture. Fold wet ingredients into the bowl with dry ingredients and start the mixer using kneed option. Work on the dough for 3 minutes, add chocolate bits and continue for another 3 minutes. I find this new stand mixer technique so easy and rewording that I am becoming a huge fan of the stand mixer era. Cover the bowl with clear wrap and leave the dough to rise for just over an hour or until is doubled. In the mean time make the flour paste for crosses by mixing all the ingredients, adding water only if needed. The paste needs to be thick but workable. To make the syrup – place sugar, water, lemon and cinnamon on a low heat and cook until sugar dissolves and water becomes syrupy and golden in colour, at the same time being careful not to burn it. Divide dough into 12 equal size pieces and arrange them onto a baking tray. Make the crosses using a piping bag and leave them to rise for another 25-30 minutes or until they double in size again. Bake for 15-20 minutes on 200C or until golden brown. Brush the buns with syrup (which is cooled down by now) after you take them out of the oven, sprinkle little raw sugar on them and leave them just a few minutes to cool down before your first bite! Many years ago we moved to New Zealand, looking for new and bright adventures. A new start included everything being new to us. New country to explore, new people to meet, new jobs to start, and new life experiences! Perfect you would say! Except, there was one thing quite old and ruined in this perfect new world of ours, and that was the first house we decided to buy. The house we laid our yes on was neglected and unloved but we were young and enthusiastic back then and thus we thought it should be ours! We thought to fix it and live happily in it for many years to come. We started with a rather impressive group of builders, but once some walls were removed, French door opened and bathroom and kitchen nicely done, we thought that it was a good time for us to move in! We knew that the walls needed to be done, and a few more jobs on top of that, but thought that we could do it! And we did! The house looked magnificent, at least to us, but peeling five layers of wall paper and a few other jobs were more than we could handle. After just a few weeks of living in the unfinished house we experienced such changes with our health that I had no other choice but to react the only way I knew – we changed our diet completely! All delicatessens and as you can imagine a lot of processed food was thrown in the bin and a new batch of greens (fresh and organic), found its way to our kitchen. So at least we had healthy food on the menu every day and long walks along the beach (in-between house needing to be finished). Now when I think about it, I am partially thankful to that experience as eating well is always a good choice. At the same time we could have done without the stress of poisoning our bodies I guess. As I said in the beginning of this story, being young and enthusiastic…can do more damage than good sometimes. It took us almost a year to finish renovating the house. We lived another two years in it before moving across the world – again. While learning about healthy choices, by reading, talking to practitioners and friends, I came across carob as a new ingredient. I loved it from the very start and as carob was another way of having chocolate (that is how I saw it) I had to come up with a cake recipe. At this time we didn’t have a strong network of bloggers and finding recipes was sometimes a struggle. One would rely on books or, if you were lucky as I was, a dear friend could give you a recipe that you would adore. It stayed all these years in my recipe book, waiting for this moment to shine! It’s a wonderfully moist and comforting cake. Carob has magical ways to make you feel healthy and at the same time to be part of this sweet and delicious cake. It’s a Mediterranean tree and although it grows mostly along the Adriatic sea (I am referring to my background otherwise you’ll find carob in many other countries) if you go for a walk in one of Belgrade’s park called Topcider you will be pleasantly surprised by many carob trees! The park ground is literally covered with carob legumes at the beginning of May, which is also a spring season. According to some previous knowledge and recent google research – carob is rich with proteins, magnesium, calcium, iron and a whole list of vitamins like, A,B, B2, B3 and D. It found its way to the medicine as well, so as I told you – healthy and sweet. It has 40% of sugar! So let’s get back to the cake! 100 gr jam of your choice for filling (I used strawberry jam as this is the most popular in our household, plus I believe that it’s matches this cake perfectly). 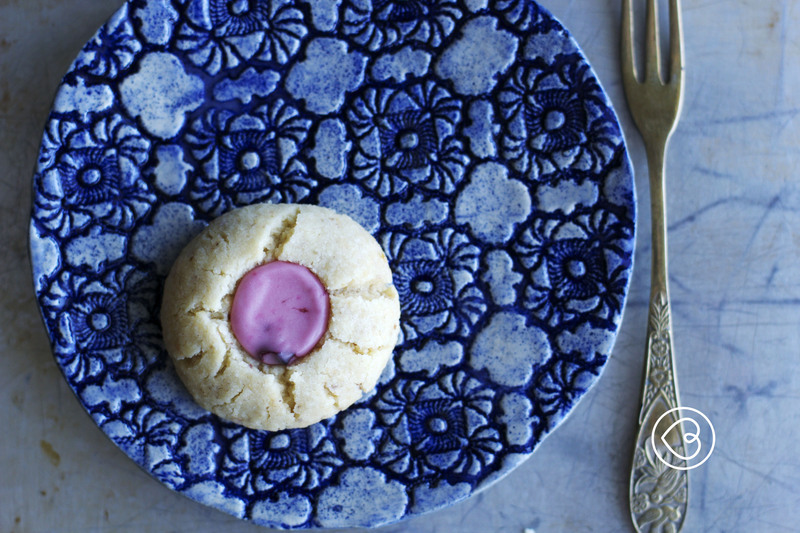 Whisk the butter and sugar until pale and fluffy (hand or stand mixer will do the same job). In a different bowl whisk lightly the eggs and add milk into it. Reduce the speed on your mixer while adding the egg and milk mixture. Once all is well combined add carob and on the end add flours and baking powder, spoon by spoon. Keep the speed of your mixer on low. Mix just until combined and poor into a lined 6″ baking tin. Bake on 180C for an hour or until done (sometimes I find that I need more time to bake this cake, additional 10 minutes or so). Use the cake tester to make sure the cake is done. Cool the cake on a cooling rack before cutting in two layers. Spread the jam onto the first layer and cover with the second layer. 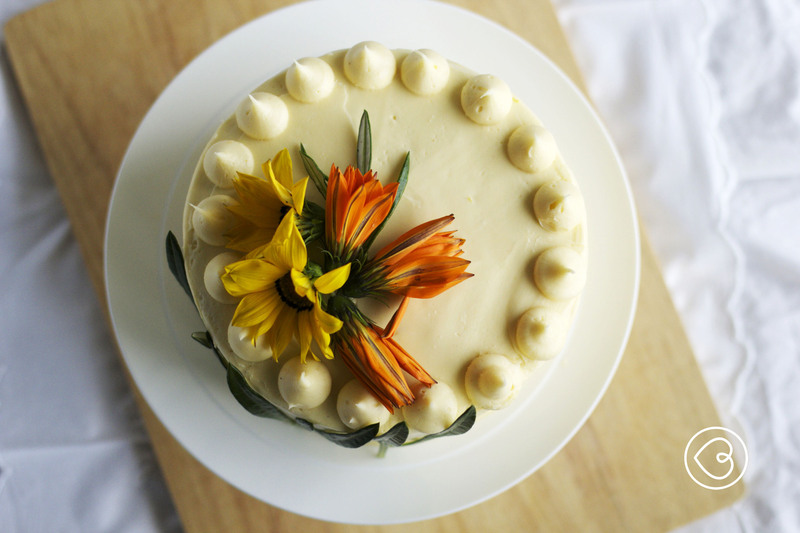 I never keep this cake in a fridge (but it can be done). It just changes taste a bit and I prefer when it’s nice and soft and on room temperature. The good thing in our case is that it never last for too long so room temperature is ok. Dust with icing sugar and slice into thin pieces as it is a very rich cake.